DENVER, CO--(Marketwire - May 1, 2008) - The sounds of personal connections shared with friends and family -- the joy of laughter, a child's whisper, hearing the voice of someone special over the phone -- are the sounds missed most by those suffering from severe to profound hearing loss, according to a recent study conducted by KRC Research. Ninety percent of those surveyed with significant hearing loss had been able to hear in the past and were therefore able to reminisce about the sounds they missed most. Of those, one in five (20 percent) said they would most like to hear the voices of friends and family again. Another 12 percent specifically cited a desire to hear their grandchildren. Half of all surveyed said that significant hearing loss causes less intimate relationships between those with hearing loss and their friends and family members. When those with severe hearing loss are pressed to pick the single relationship that is most adversely affected, most cite their spousal relationship (26 percent). All survey respondents, including those with significant hearing loss and their family and friends, see the inability to enjoy talking on the phone as the biggest impact on their lives (72 percent). The survey was commissioned by Cochlear™ during Better Hearing and Speech Month to help Americans better understand what the loss of sound means to those with severe to profound hearing loss and the importance it has to personal relationships with friends, family members and colleagues. Since its founding a quarter of a century ago, Cochlear has brought the miracle of sound to more than 140,000 hearing-impaired individuals across the globe. 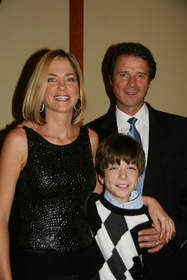 Emmy award nominee and actress-singer Kassie DePaiva of "One Life to Live" has a son, J.Q. DePaiva, who was born deaf but can now hear with the help of a cochlear implant. "We have come to appreciate the everyday sounds of life and are grateful for every word and sound that J.Q. can hear," DePaiva said. "I encourage those suffering from hearing loss to get their hearing tested or to help loved ones -- a mother, grandfather, child, uncle or friend -- do the same so they too can appreciate all that sound can do to build a relationship." Sixty percent of adults surveyed who have a relationship with someone who is severe to profoundly deaf want the person suffering to get treatment so they can have better relationships. Almost half (44 percent) of those surveyed who have not sought treatment for their hearing loss say they did not believe there was any effective treatment. An equal number said their healthcare provider did not inform them of their options. Among those surveyed with severe hearing loss who have sought treatment, almost half (47 percent) were motivated by encouragement from their family. "Approximately 30 million Americans -- experience some form of hearing loss. While many of these can be helped with traditional hearing aids, for many, even the most advanced and powerful hearing aids cannot provide an adequate solution," says Chris Smith, president of Cochlear Americas. He also notes that, '"Many of those people suffering aren't aware that there are life-changing treatments including cochlear implants for severe to profound hearing loss, or Baha for single-sided deafness or mixed and conductive losses. It is estimated that less than 10% of the population who could benefit has taken advantage of cochlear implant technologies." May is Better Hearing and Speech Month, an opportunity to educate the public about the value of hearing, the need for hearing loss prevention and hearing conservation, and about available hearing loss solutions. Please log onto www.RaiseYourHand.info to learn more about hearing loss, and to share the details of your favorite experiences with sound. This survey was conducted online within the United States by KRC Research on behalf of Cochlear between March 10 and March 23, 2008 using a sample of 506 adults (aged 18 and older). The sample included 200 severe to profound hearing loss sufferers and 306 friends and family of sufferers, drawn from a list of pre-identified sufferers and friends/family. Respondents for this survey were selected from among those who volunteered to participate in the study and the data have not been weighted. Because the sample includes only persons self-selected for participation and not a probability sample, no estimates of sampling error can be calculated. All sample surveys and polls may be subject to multiple sources of error, including, but not limited to, sampling error, coverage error, and measurement error. Since launching the world's first cochlear implant system more than 25 years ago, Cochlear Limited and its U.S. headquarters have brought the miracle of sound to more than 140,000 hearing-impaired individuals across the globe. Cochlear's state-of-the-art technologies, based on extensive research and development at preeminent academic institutions, restore the ability to hear sound and understand speech -- enhancing both learning capabilities and quality of life for those with severe to profound hearing loss. Cochlear has remained the market leader in its field thanks to an unwavering commitment to innovation, reliability and customer support. Numerous awards, as well as published scientific data, attest to Cochlear's outstanding product line and unsurpassed performance. Cochlear's promise "Hear now. And always" reflects their philosophy of a lifetime commitment to those individuals who choose their products. For more information about Cochlear's products, call the Cochlear Nucleus Hotline at 800/458-4999 (Voice) or 800/483-3123 (TTY) or visit the website at www.cochlear.com. You may also contact the public relations representative listed at the bottom of this press release to schedule an interview with a cochlear implant audiologist or patient. 'One Life to Live' star Kassie DePaiva shares her family's emotional story about hearing loss.